Since I am more and more interested in aged Rieslings now, I will try to taste some more bottles in the coming months. As a starting shot I found a “medium-aged” Riesling from the Nahe, which was some kind of special-edition for celebrating the 250th birthday of the Höchster porcelaine manufacture. 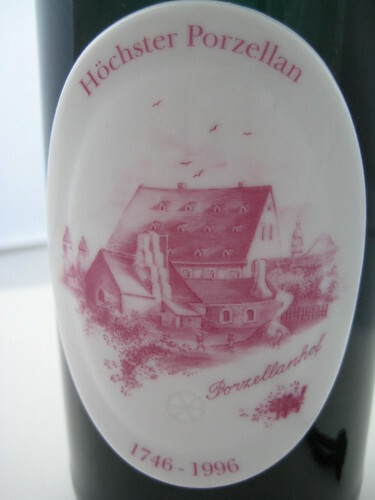 Therefore the bottle wasn’t equipped with a regular paper label, but with a porcelaine badge instead featuring a drawing of the old manufacture. Only the back-label (which was a paper-label) informed ous that it was a 1994 Riesling Auslese from the Nahe, a smaller appellation named by a river which is an offset of the Rhine. The wine was made by the Prinz zu Salm Dallberg`sches Weingut, one of the oldest estates in Germany (first mentionned in 1200) which has always been owned by the same family. We drank the bottle as a starter, which can often be a good purpose for aged Rieslings. It had a rather dark colour, more amber than golden. The nose wa clearly a matured Riesling nose with some Edelfirne reminding of bee-wax mixed with honey. On the palate it was rather dry with an iodic touch and medium acidity and later also a touch of spiciness. The finish was long with a slightly fresh note and without bitterness. This Auslese was still very nicely drinkable, more reminding a good sherry than a fruity white, but this is one of the many facettes a Riesling can have.